Synopsis:Two people are abducted, imprisoned, and left with a gun. As hunger and thirst set in, only one walks away alive. (26) Review: As soon as I started reading this book the only thing that came to mind was the Saw movies..I haven't even seen the Saw movies but I remember seeing previews about them where they put people in impossible positions and told them if they did something horrific they would be free. The people who get trapped in these "games" find themselves in no win situations. Yea they may live but killing someone else is bound to change you in very profound ways. So which is the thrill for the unsub? The killing or the aftermath of the survivor? Twisted up in this is Detective Inspector who seems to have issues of her own. For a woman who was the youngest female to be given the title of Detective Inspector she sure seems to be easily tricked and swayed. As the story progresses it picks up pace a bit but the story still seems contrived and not quite thought out. The ending jumped the shark for me a bit and wasn't satisfying in the least. There are apparently three books in this series so far, the 2nd Pop Goes the Weasel coming out in the USA in Oct 2015. 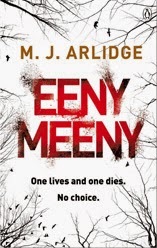 I'm not sure if I will give it a whirl or not, but here is to hoping that this is just a first book blunder and MJ Arlidge works the kinks out in the next one.